Eh, you know how these threads go. So here's my Suteki, built with love and mostly garbage. 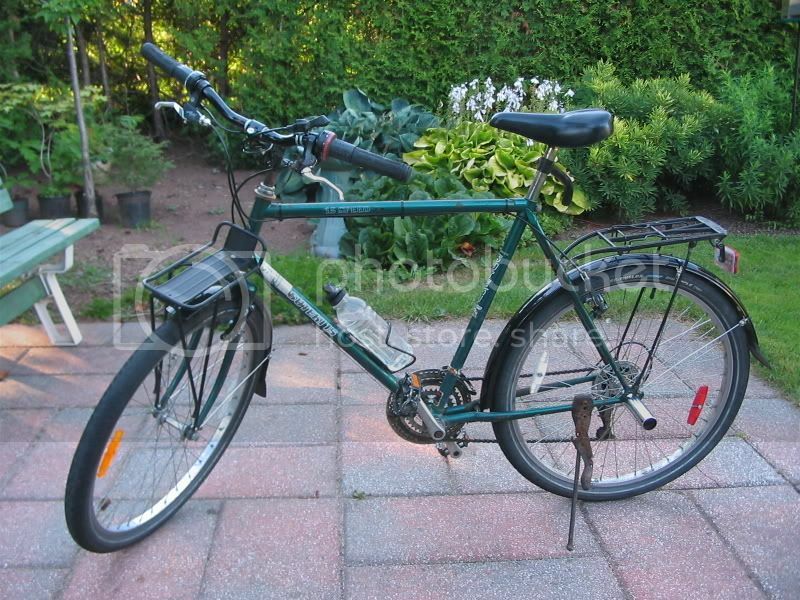 I wanted a bike that would fit me like a glove, be about as practical as can be and not attractive to theives. So I've put this bike together around early summer, but I've been changing stuff around a bit at a time and by now it's getting seriously good. 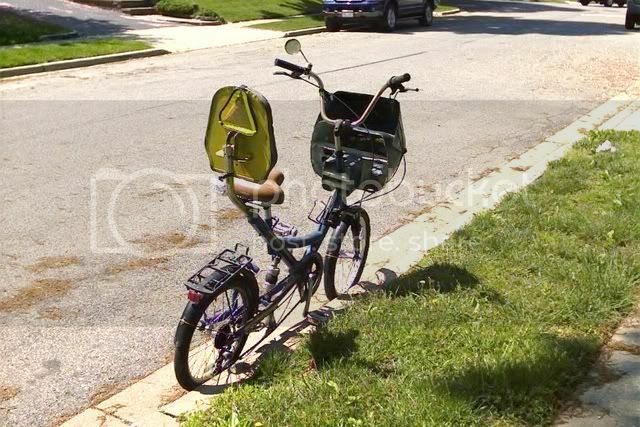 One more thing it could use is a kickstand on the front wheel like on french mail bikes, because what happens is when the front is loaded the bike won't stand up on it's own. As is, 29.5Kgs light. The rear rack is real tough and has plenty of surface so it's fairly comfortable to sit on, it's also got the sideways bar to tow other bikes with. There's an MTB barend on the seat tube so riders can hang onto, also a BMX peg on the non-drive side. 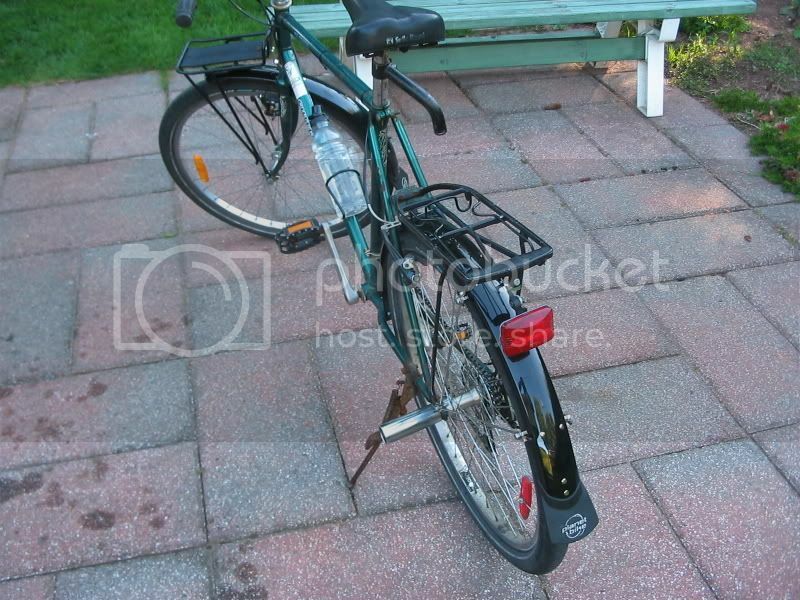 The idea is I can give lifts to people with it, they sit amazon, Amsterdam style. One issue I have with this setup is that I can't use my axle mount trailer with it, I'm thinking modding the trailer wouldn't be so bad. The handlebar has a friction shifter for the rings and a grip shift for the cogs, but it's a 7 speed shifter and there's 5 usable cogs, so first gear is 3. One of the front brake post braze ons has broken off so there's nothing attached to the front brake lever, the string keeps it from hitting my fingers over bumps. I'd like to find a front wheel Sturmey Archer brake hub. 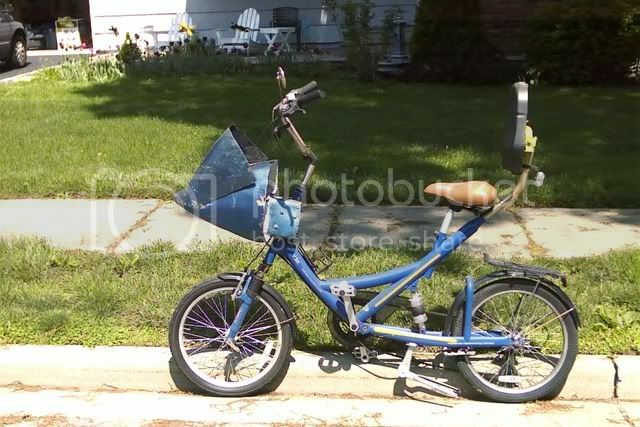 The other side has a throttle, but there's no motor on this bike yet, I've ordered one though. 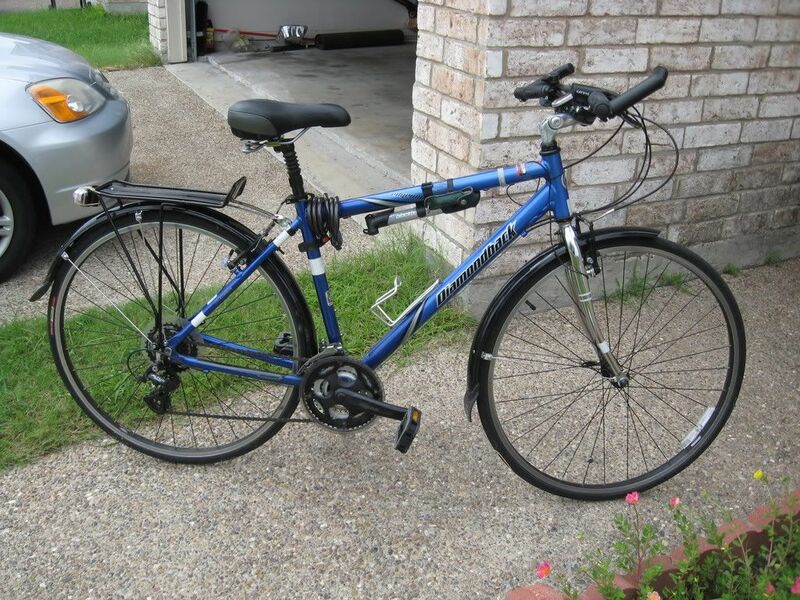 We shall see what it gives, if there's one bike that can use it this is it. the rear brake lever is pretty good, you can dial in the mechanical advantage you want. 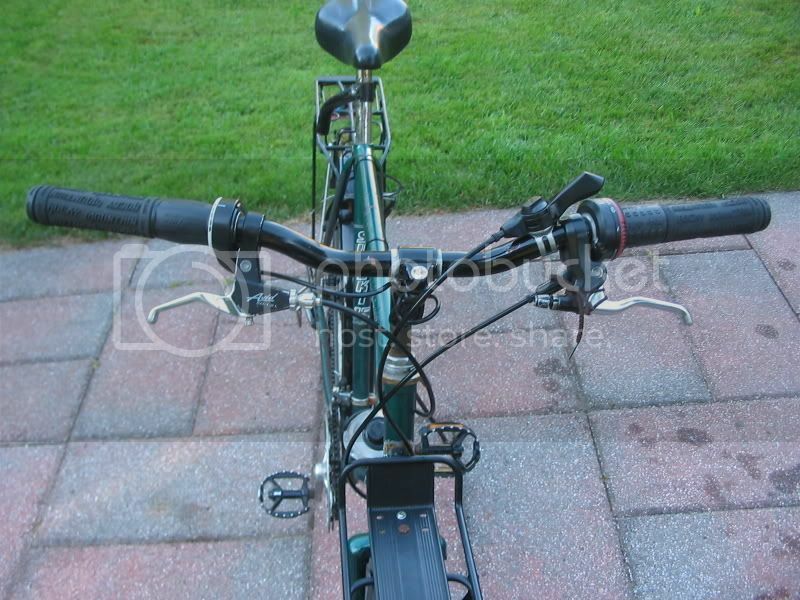 Rear brake is a Deore LX parallelogram V brake thing with cool stop MTB pads, ample power. On the rear I've added a derailleur protector and dork disk, since I'm more interested in having it last then to have it be light. The smallest cog can't be used because the nut & bolt of the fenderstays is in the way. The biggest cog in the rear is a 28, the small ring is 32-34ish. This gearing is wrong for hauling serious loads uphill. If the proportions were kept equal, having the big rear cog bigger then the small ring would probably be about right. 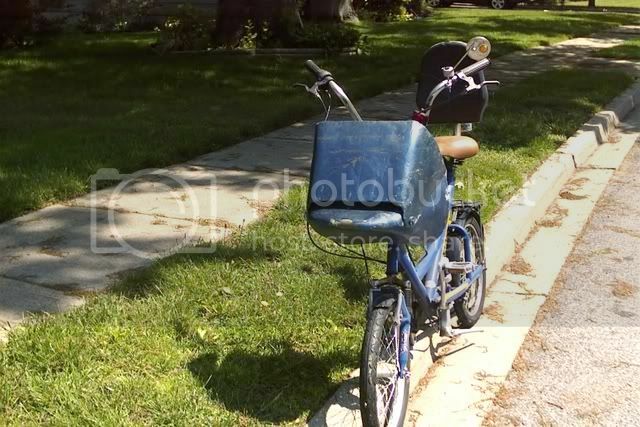 Here is my dedicated grocery getter a 1976 Schwinn. This bike started out to be a restoration project but after I cleaned it up and rode it a few times I realized that this was really a sweet bike and suitable for an old man. The rack is made from a discarded skate board trimmed to fit. The stay for it is the seat stay from a frame I had taken other parts from for another project. Strong, wide and flat it makes a good seat for a passenger or to tie down a case of beer. The half-buckets are held on by industrial zip ties. I had planned to do something more sophisticated but zip ties are so cheap and quick I have continued to use them. 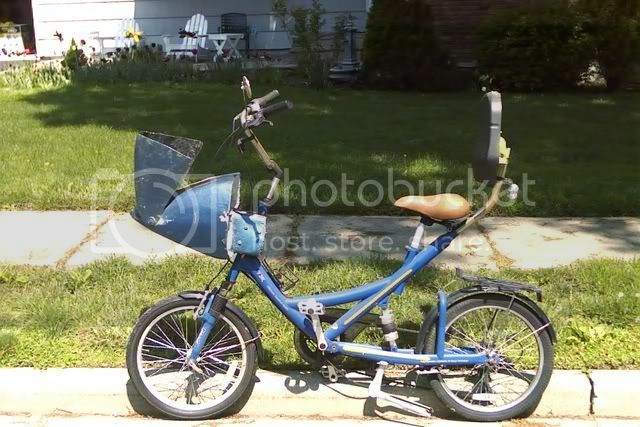 Since the bicycle is used for cargo I leave the buckets installed. I can get more in them than I really want to carry. The front bucket is a Bell off the shelf item easily detached and really convenient with a carrying handle. The original running gear has all been replaced with heavier stuff. The original wheels were light weight 1 3/8's replaced with 1.95's on steel wheels. The original gearing was a 10 speed but is now a 15 speed. The crank set is a 3 piece and has 3 chain rings (28-38-48) and the rear is 14 through 28. I don't have any hills here (unless you count the bridges) so you'd think I wouldn't need that kind of gearing but there are no bike paths, side walks or smooth shoulders either. Sometimes I need the gearing to get through the tall grass, gravel and in and out of pot holes. 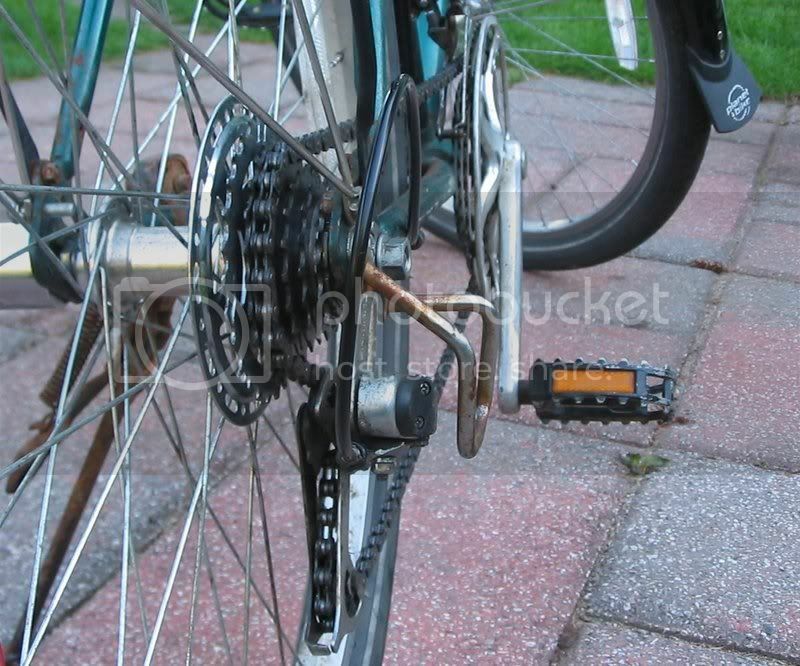 I retained the stem shifting levers for the chain ring shifting (nostalgia) and have an index shifter for the rear. Mostly I stay on the center ring (38t). The brakes have been replaced with heavier duty rim brakes and would be inadequate for hilly country but that is not here. The bike is stable and rock solid empty or under load. It weighs 45lbs. I haven't needed more capacity yet but I think I will add an extension like the extracycle only home made. I'll post pictures when I do. It ain't real pretty but it works and I have become emotionally involved. I get offended when it is insulted. Maybe I need professional psychiatric help. I think it's beautiful, oldfool. Hey, I love the chicken graphics on the skateboard/rack. Nice bike. Here's my own daily ride, a 90's Kona Fire Mountain. Apparently, it was once a race bike, though that rumor is unsubstantiated. Still, it's pretty light and I can pick it up with one hand if I want to. Looks like the ticket to me! 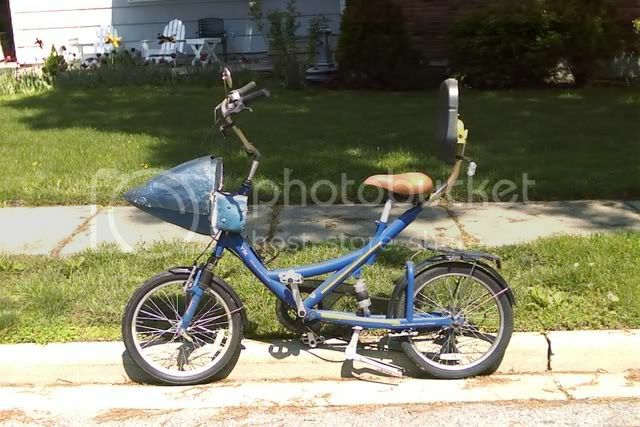 The only bikes I make fun of are the weight weenies because they make fun of me, but quite often the joke is on them when I get where I am going before they do I love utility bikes and the more owner original the better! Ive been toying with this old mountain bike for a while now. The wooden rack that I built can now hold the weight an adult, so it does a good job of carrying my junk... and it cost very very little to make. With the semi-slick tires, it has become my commuter, since I only have 0.7 miles to work and it allows me to be 95% car-free! 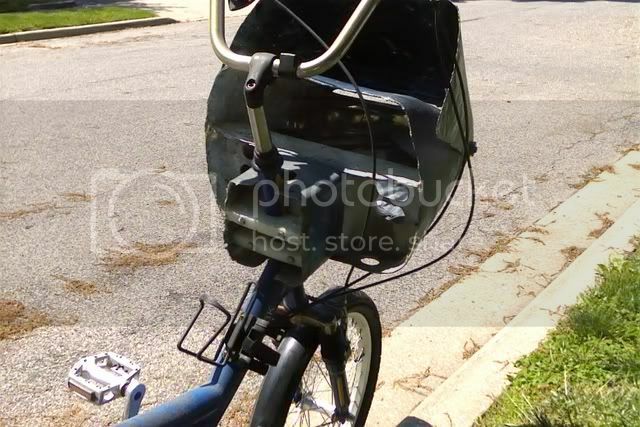 Coming soon, wooden (lockable) removable panniers, wooden fenders, & homemade trailer. I like it. I'm doing a front rack and looking for ideas. Maybe in bamboo. Last edited by oldfool; 08-14-07 at 04:51 AM. Good idea. The hardest thing to decide is how to attach it to the bike... the mount points ought to be metal if they are going to last. As you see, I have used angle steel for attachment at the axle (it is also providing support for the future panniers, but that is secondary). If you are working with bamboo, you might consider fabricating a round bracket that will allow the round bamboo to slide in, instead of attaching the bamboo directly to the bike which would create a localized stress and end up splitting the bamboo down the grain. Likewise, pay extra attention to ALL your stress points - think about which directions your cargo weight will try to shift, and adjust your geometry accordingly. It's definitely been a rewarding project, and I get lots of double-takes. No trouble, but just for your info, once you posted something, you can actually edit it or delete it (just look for a little links under the post that say ). ...............you can actually edit it or delete it (just look for a little links under the post that say ). The lid can be tilted back for better aerodynamic drag ratio. The lid closes to keep out the rain. It looks like this from the front. This is the view from behind. A close-up of the mounting hardware, made from 1"x4" polyethylene stock. The frame is a Worksman Y3K. Worksman is known for it's utility bikes, but the Y3K comes without a utility box. The Y3K is furthermore out-of-production. Hi everyone, this is my first post. I've been lurking for some time though! I think this is the most appropriate place to post a picture of my bike. 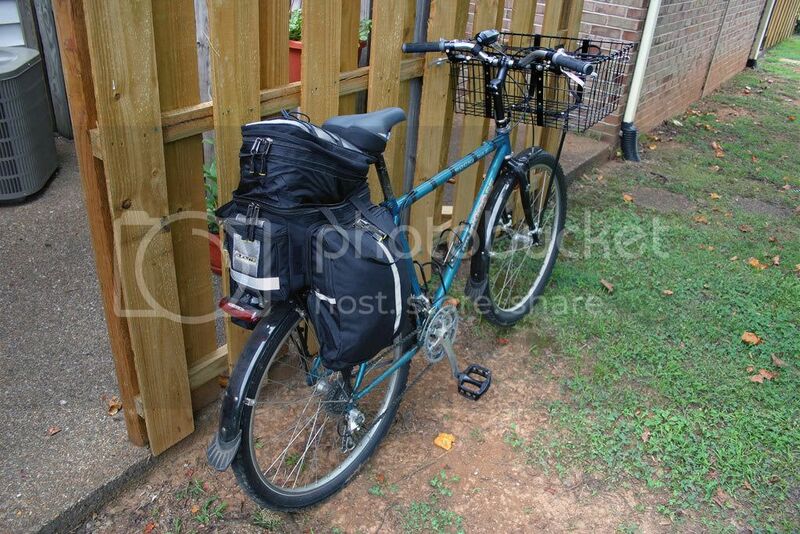 I use my bike to get groceries, carry lunch, water, and anything else that needs carrying. I have two boys 7 and 9 so there is always LOTS of 'stuff' to carry! 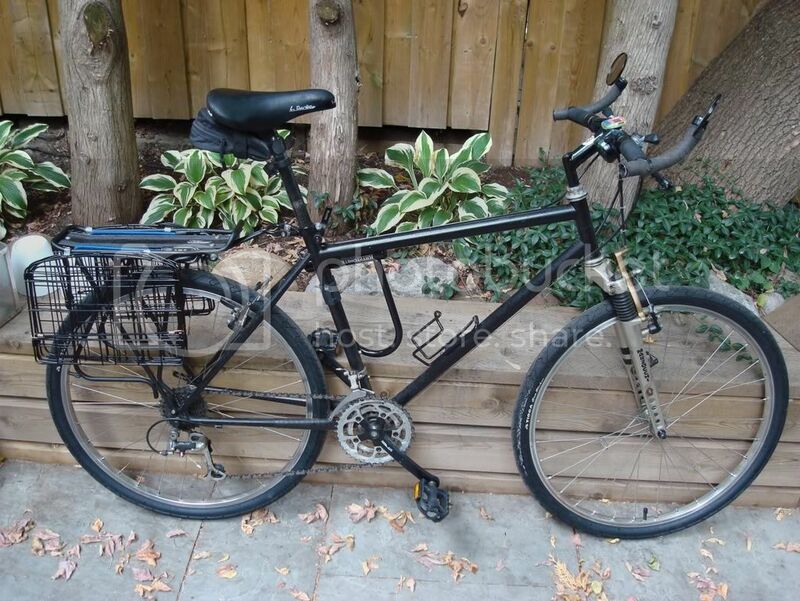 I'll update with REAL pics when the bike gets here but i went against tradition and ordered a shiny new bike to beat up on trips to the store. hey, nice ol Syncros CattleHorns!